Provide comfort for the family of Cindy Irvine with a meaningful gesture of sympathy. Suddenly at the Brockville General Hospital, on Thursday, January 10, 2019. 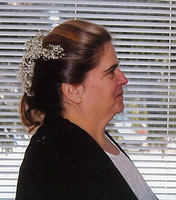 Cindy Marie (Dillabough) Irvine, at the age of 57 years. Beloved wife of Dennis Hugh. Dear mother of Jason and Amanda MacDonald. Sister of Peggy Stitt and Karen Bukacz (Donnie McLeod). Cindy was predeceased by her parents Shirley and Bernie Dillabough. Family and friends are invited to pay their respects at Irvine Funeral Home and Chapel, 4 James Street East, Brockville on Wednesday, January 16, 2019 from 10:00 am until 11:30 am when a ceremony celebrating Cindy's life will be held in the Chapel at 11:30 am. Officers and members of Oddfellows Brock Lodge No. 9 will gather for a memorial service at 9:30 am. As expressions of sympathy, donations to Diabetes Canada or the Heart and Stroke Foundation will be gratefully acknowledged. Send condolences or make a donation online at www.irvinememorial.com. Officers and members of Oddfellows Brock Lodge N. 9 will gather for a memorial service at 9:30 am. Provide comfort for the family of Cindy Marie Irvine (Dillabough) by sending flowers. My heart felt sympathy Dennis, may God’s love and grace be with you. So sorry to hear about Cindy's passing, and extend our sincere condolences to you and to Cindy’s family. God Bless. Dear Dennis, Karen ,Peggy and family. Please accept out deepest sympathy on the passing of Cindy. she was a sweet lady. You are in our thought at this difficult time. Dear Denis,Peggy,Karen & Cindy's children We where so sorry to hear of Cindy's passing. Our thoughts will be with you all in the coming days to come. RIP Cindy your now with your parents.